There are so many devices on the market that sometimes it's overwhelming trying to decide what is worth spending the money on (they are usually pretty expensive). In the last 5 years devices have come a long way and in my opinion many of them deliver the same treatments that you would pay thousands of dollars for at a dermatologist's office or spa. 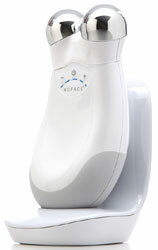 The NuFACE is one of the devices that I have personally seen results from and heard many other women say that they have as well. If uses microcurrent technology, a gentle electrical stimulation, to increase collagen production, improve skin elasticity and help products penetrate the skin. This device leaves skin looking tighter and more radiant after the first use, and over time it is truly the only device that I have ever heard of working for the dreaded "turkey neck". The NuFACE use to look like this, but has recently come out with the Trinity, which is a little bit more pricey but has an easier to hold design and interchangeable treatment heads (coming out soon). Considering the fact that IPL can cost around $300 a treatment, the $325 price tag on the Trinity is not that bad once you factor in being able to use this at home at your convenience. P.S. I have heard that this helps to tighten skin after having a baby in all of the places you want your skin to be tight again...push gift?